Let’s take a fun trip down memory lane. The date? June 2002. Location? Corpus Christi, TX. 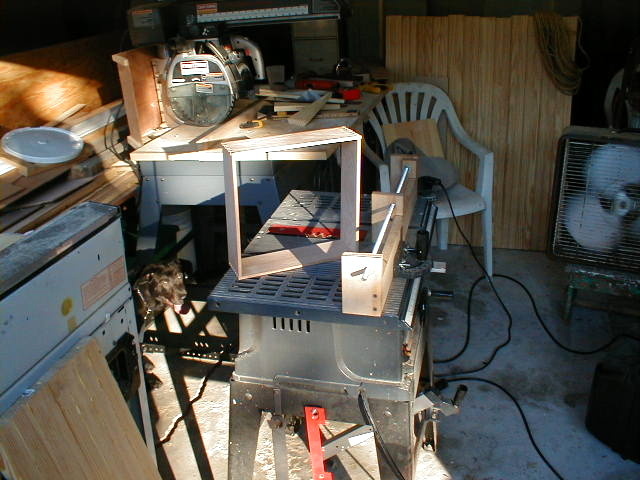 This was my first wood shop. Not nearly as roomy as my last one but it was workable. Our 2 car garage also double as general storage. I had to pull the tools and projects out of the garage to work on them. Working outdoors in the sun was not fun, especially in the middle of summer in Texas. And rain meant no work, period. The little table saw was my first one. I’ll tell you about Sheba in my pet share on Tuesday 2/24. The frog house was the first project I completed using finger joints. 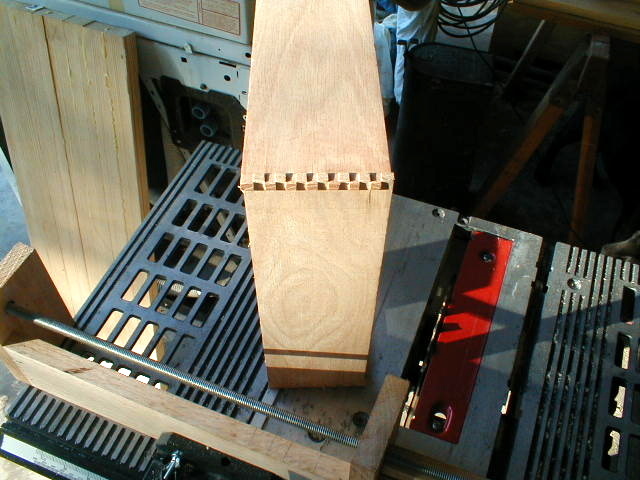 The gizmo (or jig) to the right side of the frog house frame is a box joint jig. 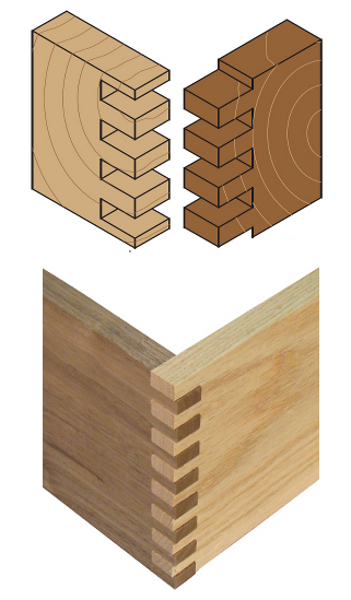 This allows the user to make very precise, evenly spaced cuts on the ends of the boards making the interlocking finger joint. This project required the fingers to be 1/4″ wide. The fingers are a bit long by design. 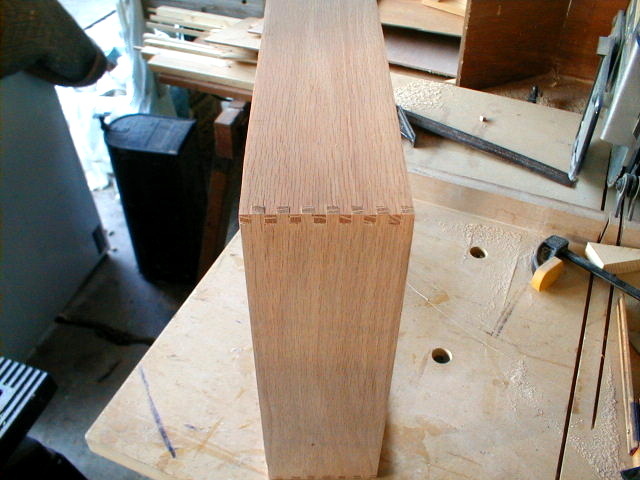 The protruding fingers are sanded smooth after the joint is glued. This technique is much quicker than attempting to cut the fingers to the exact length. After sanding, the corners are perfectly aligned. 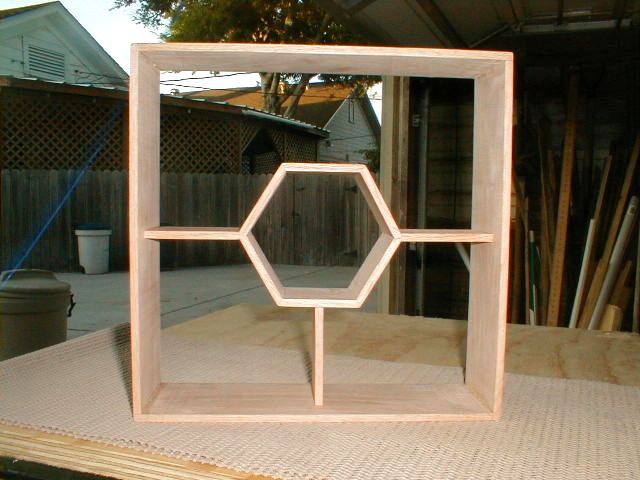 Next I cut a six-sided polygon (hexagon) and made support pieces so the hexagon would appear to float in the center of the box frame. I intentionally omitted a top support so there would be a useful seat for a frog. The back is open so the small spaces inside the frog house would seem larger. I did not want the frogs to get upset because of crowding. At this point the frog house is complete and ready for the finish coat of polyurethane. Here is the finished project, complete with frogs and a couple of bears. The frog house was made for a friend who worked with me in the Education Department at Driscoll Children’s Hospital in Corpus Christi. 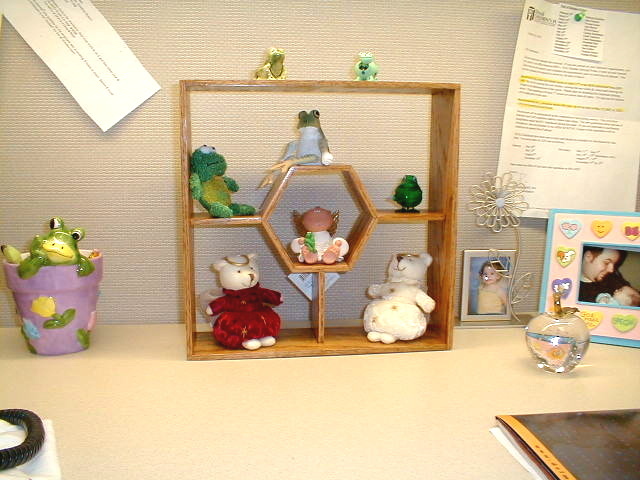 Rebecca loved frog knick-knacks and had them scattered around her cubicle. I am glad I was able to make a home for her frogs and other critters. 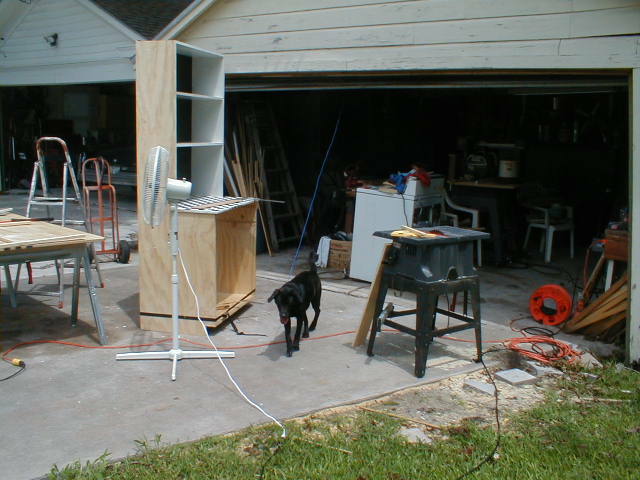 This entry was posted in Friday Photo and tagged craft, frog house, Frogs, woodshop. Bookmark the permalink. Impressive! I couldn’t hold your toolbox. Took your advice on Harrison’s Landing; it was superb! Posting about it soon. Thank you Mike. Glad you enjoyed Harrison’s Landing. so cool – especially that you made it for a friend – my dad always wanted to work with wood – my mother told me that he decided to make a cupboard – borrowed all the tools, had advice from well intentioned buddies – spent hours planning, building and it was crooked and the door didn’t close – gave away all his tools, threw out the cupboard and never looked at wood again! Looks easy but I know it’s not! Johanne, thanks for the feedback. So sorry to hear of your Dad’s bad experience. I too had some not so successful projects. Some I could rescue and others made good firewood. My sweet, sweet man loves to work with wood too! So neat that you made a frog house. It came out great! Nice walk down memory lane for you.